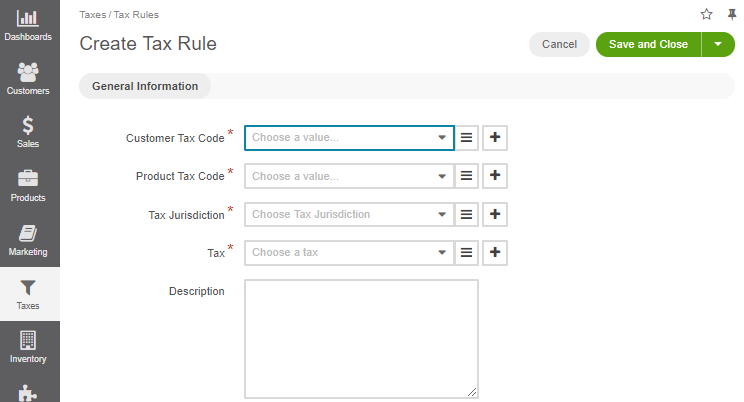 See a short demo on how to create tax rules in OroCommerce, or keep reading the step-by-step guidance below. To create tax rules for a particular tax jurisdiction, you need to complete the configuration of the tax options described in the Tax Rule Prerequisites section. Once all the necessary actions are performed, you need to create a tax rule for every valid combination of the tax rates, product types, and customer types to ensure that they are properly taxed at every checkout. Navigate to Taxes > Tax Rules and click Create Tax Rule. Select a customer and a product tax codes in the respective fields. Select a tax jurisdiction in the Tax Jurisdiction field and a tax rate in the Tax field. Describe this tax rule if necessary in the Description field.